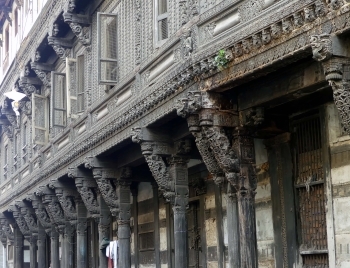 The Historic City of Ahmadabad is a walled city dating from the 15th century, especially known for its fusion of Hindu, Jain and Islamic elements. Further notable are its wooden houses (pol). The city wall dates from 1759. Ahmadabad is not exactly a beautiful city, with the historical buildings intertwined with all kind of modern ramshackle buildings and the typical indian street chaos. It's dirty and dusty and very lively. I visited the old core with the heritage walk, which definitely leads you to places you would not have seen by your own, but was also a bit overcrowded (mostly indian students). The WHS description concentrates on the old building clusters (called pols) in the innercity. 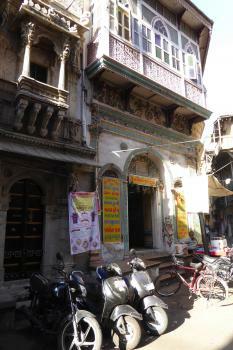 Other Ahmadabad sites like the stepwells, the sidi-saiyyed mosque and the jain temple are not mentioned. The old havelis have a very dusty charme - there are intricate carvings, beautiful decorations, but everything has a worn-out feeling. On the plus side, it definitely does not feel touristy. The proposal also seems to be the only indian WHS that concentrates not on palaces, ruins and temples, but on normal residential areas - I would therefore welcome its inscription (also as an incentive to preserve the buildings). The first impression: Ahmedabad is a very dusty and very dirty city. But if you have a chance to spend there more than 2 days you will discover lots of gems - not only the mosques (Sidi Sayid, and Friday mosque) and museums (Calico Textile and city museum are the must! ), but also beautiful old houses, temples, Badra fort (possible to visit now) and at least two step wells in the eastern part of old city. Hint: as Ahmedabad is not a tourist trap at all you should know that there's only ONE place where you can buy postcards and souvenirs: boutique heritage hotel House of MG, opposite Sisi Sayid Mosque. Hindu pilgrimage sites: Swaminarayan Temple. "the first temple to be established by Swaminarayan Sampraday, one of the most popular Hindu leaders of recent centuries. It is also serves as one of the two seats (HQ) of that movement. Among the nine temples personally founded by Swaminarayan, it is arguably the most popular among pilgrims as he spent much time here and there are artifacts connected to his life that are kept at the temple."